In January 2001, the cemetery said it had more than 80,000 burials.The office has most records computerized. It also has old index books and plot cards that may provide more information. 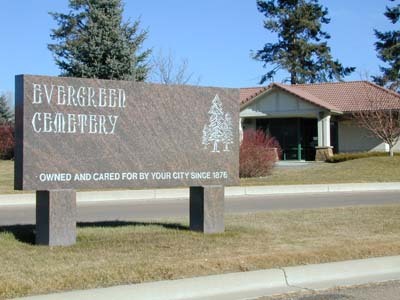 The book Evergreen Cemetery Records, Colorado Springs, El Paso County, Colorado, 1856 to October 1972 was copyrighted by Athlyn Luzier and published by the Pikes Peak Genealogical Society in 1993. Upon her death, Luzier's estate assigned the copyright to PPGS. Following is information from this book, which is in alphabetical (not plot) order. Evergreen Cemetery data (alphabetical order) Note: this is a large file and will take several minutes to load on slower computers. Be patient! Additionally, Valerie Eichler Lair and volunteers have been updating the present database since its 1972 cutoff. Their updates through 2006 may be viewed online at http://usgwtombstones.org/colorado/elpaso.html under the second entry for Evergreen Cemetery.